I haven’t been in Sweden for Halloween since 2009. It was a glorious year. I was dressed as a zebra and did some graceful bounding while disembarking from the train. I remember that I was dressed as a zebra for two reasons. One, I wrote a post back in 2009 about it called Halloween in Sweden. Damn this blog and its ability to remember everything I did. And two, before moving back to Sweden I was cleaning out my closet in July and came across a pair of white pants that had clearly been ruined by duct tape. Turns out I hadn’t taken much care of my zebra costume. Turns out I also didn’t have much need for a pair of white pants. Weird. I really am terrible at taking pictures. Especially one-handed so as not to call attention to myself. Halloween in Stockholm has become more and more popular. For one thing, people talk about it. Openly. They do sometimes seem a bit confused though, wandering around in costumes on the Monday before Halloween. New holidays are hard. There’s still a big ghost hanging over Drottninggatan. So they've got that going for them. And now Halloween-themed ads are almost common, like the McDonald’s ad creepily asking you “Chick or cheese?” Get it? Trick or treat? Chicken sandwich or cheeseburger. They rhyme. Kind of. Very cute. There are even pumpkins popping up in grocery stores. For example, at one of the many grocery stores that I sometimes find myself shopping at, you can buy what is being billed as a giant American pumpkin. Only 3 000 SEK! $400. Or as I like to call it: half a month’s rent. I can only wonder if this is, finally, the Great Pumpkin, Charlie Brown. But I even found numbers to prove Halloween is growing in popularity alongside my own anecdotal evidence. Depending on which study you believe somewhere between 30-40% of Swedes will be celebrating Halloween. GP suggests that a whopping 16% are planning on having candy at home for trick-or-treaters, 10% are going to make jack-o-lanterns, and 8% are even going to go to a Halloween party. One website claims that Swedes spend one billion SEK every year on Halloween. That’s over 136 million USD. It’s a super legitimate looking website, which is why I wanted to be sure to cite it, like any good academic would. But the statistics that count the most? They come from Expressen. Did you know that Karamellkungen, a glorious company that makes me feel bad about my eating habits every Saturday, says that sales of candy increase by 50% around Halloween? And did you know that sales of pumpkins have increased from 500 metric tons in 1999 to 1 100 metric tons today. So many conversions, but that’s an increase from 1 102 311.31 pounds to 2 425 084.88 pounds. Approximately. Halloween is coming. It’s not yet beating out All Saints Day, but it’s trying. Welcome to Sweden. 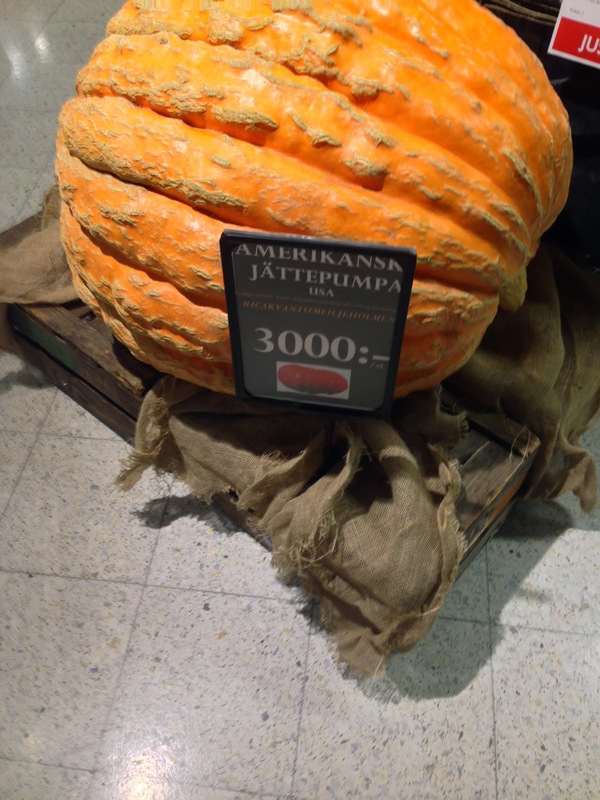 And a quarter pound of pumpkin for every Swedish citizen. Thankfully I didn't see anyone in blackface this year... I was planning on taking a picture of it surreptitiously. I'm also proud to say that it only took 2 attempts to spell surreptitiously right. You know, I didn't see that either. That was kind of a relief. And ugh. That word is super hard to spell. I usually just try to get close and let the spell check take care of it. I spoke too soon... saw several women dressed up as "Indian Princesses" or whatever white-washed name Halloween costume-makers give to that nonsense.